Step 1 Fry the bacon in a heavy 12-inch skillet over medium heat until crisp, 5 to 6 minutes. Drain on paper towels and set aside. Reserve the bacon grease in the skillet, but discard any large bits of bacon that might burn. Step 2 Meanwhile, slice the tomatoes 1/3-to 1/2-inch thick. Mix the cornmeal, salt, pepper, cayenne and sugar together in a pie plate. Dredge the tomatoes in the mixture. Step 3Add 4 tablespoons of butter to the reserved bacon grease and melt over medium heat. If you prefer not to use the bacon grease, wipe the pan clean and add a little more butter, about 2 tablespoons. Step 4When the foam from the melting butter has subsided, add the tomato slices and cook until golden, 3 to 4 minutes. Carefully turn the tomatoes with a spatula and cook for 3 to 4 minutes more. Step 5Toast the bread slices until golden. To assemble the sandwiches, spread the bread with mayonnaise to taste. Arrange the tomatoes on half of the bread slices, then place the bacon on top, followed by the onion slices--one per sandwich--and the lettuce. Place the remaining bread on top of each sandwich and slice in half. Secure the layers with a toothpick. In Recipes-list.com we have selected the most viewed recipes from category - Sandwiches . Enjoy the best recipes specially selected for you! 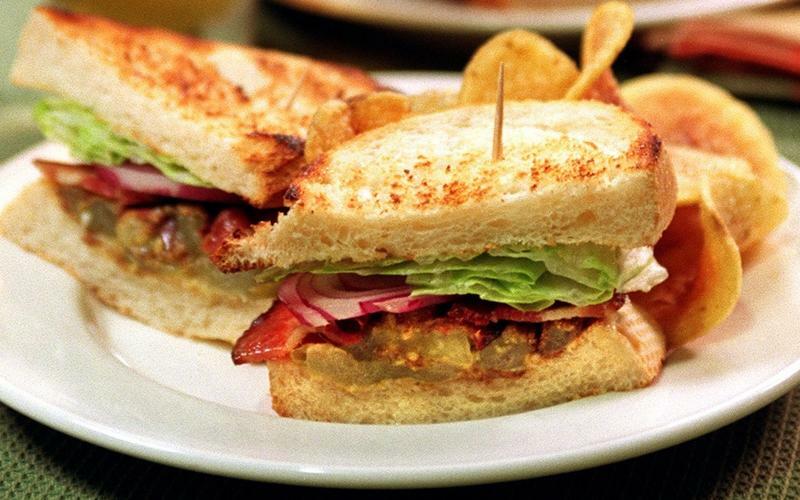 Bacon, Lettuce and Fried Green Tomato Sandwiches is the right choice that will satisfy all your claims.